Nationally acclaimed lap steel guitarist Sterling Koch explores new, explosive blues/rock terrain on this his second steel guitar CD. 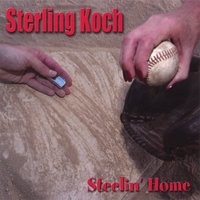 Nationally acclaimed lap steel guitarist Sterling Koch (pronounced Cook) releases his second steel guitar album, "Steelin' Home." The album is a mix of various blues/rock styles from uptempo Chicago shuffles to Texas style rockin' blues all featuring Koch's soaring lap steel guitar. From the double time rhythm of the opening song " 'A' Praise" to cover songs by Rev. Gary Davis, Bob Dylan, Peter Green (Fleetwood Mac) and The Holmes Brothers they all mix in seamlessly with Koch's arrangements of traditional blues standards, "Mean Old World" and "If I Could Not Say A Word."